Over the past 12 months, we have held events in a number of overseas locations as well as here at Wiston House in Sussex. In this summary, we look back at some of those discussions. The 2012 programme has been extremely busy facilitating over 50 conferences and meetings. Most of these have been held at Wiston House, our rural West Sussex location, whilst others have been held in London, Jakarta, Bangkok, Beijing, Istanbul, Tbilisi and Geneva – a trend we hope to continue into the future. A particular highlight of the year was our Annual Address, this year presented by HE Dr Susilo Bambang Yudhoyono, President of the Republic of Indonesia, who spoke on ‘Indonesia’s role as a regional and global actor.’ This followed our first conference in Jakarta in September, on Indonesia’s economic development: contributing to a sustainable growth pattern, which culminated in the signing of a Memorandum of Understanding with the Indonesian Ministry of Foreign Affairs. 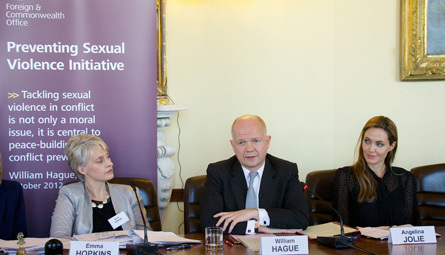 In November, The Foreign Secretary’s Initiative aimed at preventing sexual violence in conflict and post-conflict situations was the focus of a high-profile conference aimed at building momentum for the campaign which is to be launched under the UK’s G8 Presidency in January 2013. The Foreign Secretary delivered the keynote address which was also attended by UNHCR Special Envoy, Angelina Jolie. Mr Hague spoke of the urgent need to mobilise global public opinion, to ensure that there is accountability and justice, and to increase the number of prosecutions of perpetrators. We have also held a number of events on global health issues, tied to our series on food security, the final two events of which will be held in 2013. In February, with support from GSK, Novartis and Medicines for Malaria Venture, we convened a group of experts to discuss the new tools to tackle malaria, including the prospects for the malaria vaccine under trial (RTS,S) to reduce and ultimately eradicate malaria. Speakers included the Nigerian and Namibian Health Ministers, Angolan Vice Minister and Under Secretary of State Stephen O’Brien, Department for International Development. This was followed in June by our Geneva meeting, The new era in HIV/AIDS treatment and prevention: science, implementation and finance. The prospects and implications of an exciting breakthrough in HIV /AIDS prevention and control strategies, namely treatment as prevention, were discussed at this meeting organised in partnership with Sir Richard Feachem, Director of The Global Health Group, University of California, San Francisco, and Gilead Sciences Inc.
Our work on food security has also continued with focus on improving diet and nutrition at our April meeting, linking the agriculturalists with health experts, and science and technology in the fourth conference of the series held in October. We have continued to build on our relationship with the Central Party School (CPS) through a series of dialogues that are set to continue into 2013 and beyond. In March, we held a seminar on Prosperity in a new world order in Beijing which explored ways of measuring prosperity and promoting sustainable growth, examined how to create institutional frameworks for global economic governance that are fit for purpose and identified obstacles. Following further discussion, the two institutions drew up a programme of events to be run jointly over the next two years, covering aspects of political, economic and social change. This included a meeting held here earlier this month on Implications and opportunities of the 18th Congress of the Communist Party of China. Additionally, we conducted a 90 Minute Dialogue at the China British Business Council in London, aimed primarily at business leaders and incorporating Chinese speakers from the CPS delegation to our December conference. With the appointment of our new Prosperity Director, Kathryn Hingston, this year we have been able to create a more specific focus on global prosperity and emerging economic issues. In November, our conference on Sustainable economic growth in small island states: challenges and opportunities brought together leading diplomats from 10 Caribbean and Indian Ocean islands as well as international experts in the field of small island development to discuss the future of economic growth in economies vulnerable to external and internal shocks. Earlier in the month, participants from Vietnam, the Republic of Korea, Nigeria, Brazil, India, China, Japan, Argentina, Mexico and South Africa contributed their own perspectives on how to tackle the biggest barriers to economic growth, corruption and protectionist practices at our conference on Promoting rules-based economic systems for global growth. In July, we partnered with British Embassies in the Maghreb, supported by Shell and Unilever, to address ways of developing the Maghreb’s economic potential and encouraging intra-regional co-operation in the run-up to the Arab Maghreb Union summit in October. The full conference report is available to download. Further conferences on the region focused on the Impact and challenges for the Middle East and North Africa one year on from the Arab Transitions and Supporting democracy: engaging and developing policies with transition countries – the role of rising global actors? Our focus on global prosperity and economic growth has also acknowledged the need to link these issues to human rights. For example, in partnership with the Institute for Human Rights and Business, we held our November meeting on Burma/Myanmar, business and human rights: setting standards for responsible business which was also attended by the Minister for the President’s Office, U Soe Thane, a leading reformist. Our defence and security programme has also tied in to our wider focus on emerging powers and shifting poles of power, in October looking at NATO partnerships in a shifting strategic landscape. In collaboration and with sponsorship from the NATO Defence College (NDC), this conference examined how NATO can take forward its partner relationships in ways that most effectively address mutual security concerns, including through initiatives such as capacity building and support to partner operations. We continued our regular dialogues on non-proliferation and arms control, holding a series of conferences on nuclear issues, looking at deterrence and assurance in the NATO area, in June, and examining the current state of Nuclear Proliferation Treaty (NPT) diplomacy in November. Our expert participants have also taken part in podcasts on these issues. Earlier in the year, our conference on Nuclear energy one year after Fukushima: challenges and responses, addressed safety, security, and proliferation issues for nuclear energy expansion in terms of technology options and governance frameworks including their interrelationships. This year has set the scene for a number of conference series that will continue into 2013, in addition to the forging of new domestic and international partnerships that will enhance our international presence and underpin the diversity and range of expertise that is evident within our events.